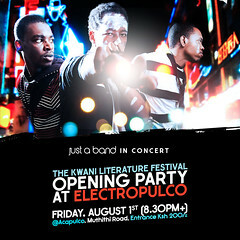 The Band, as I get to call them, will be performing on August 1st at Kwani LitFest. This is one event I did not want to miss but hope that my friends and readers in Kenya get to go and enjoy. If someone decides to stream the event (hint http://www.ustream.tv/) please oh please let us diaspora folks know. More info on location and times, please check out the JAB blog. Just this once I will give them a pass for not tagging the location of the event in Google Earth, it seems they are hard at practice. For the diaspora folks in Washington DC, if Jay-Z makes you ‘get that dirt off your shoulder’, if you like John Legend, Youssou Ndour, Alek Wek, Tyson Beckford and other gorgeous African stars, check out the Africa Rising concert at the Kennedy center. This is the last part of the JAB interview, the first is here. It was fun reading JAB’s responses, and I hope you enjoy this last bit. Before we get to that, here is one more pic of the trio. Iwinyo Piny & Animation in general. The chicken or the egg question: Which came first? The animation or the music? BILL(Blinky): The music. We used to jam in campus. And thatâ€™s where everything else spun off from. JIM: The music came first, definitely. As always, it was a random happenstance (our music usually is). Then Dan went, â€œWe could do a cartoonâ€¦â€, and here we are. DAN: The music was there first, but I can remember some occasions when the animation influenced the song, especially the lyrics, coz there was supposed to be more words that would have made it clearly a song about a girl, but when we talked about the video concept allowing for a broader interpretation, the lyrics were trashed (after which one station told us they couldnâ€™t play our song coz it didnâ€™t have any lyrics! Haha!). What is your animation history? DAN: I did this one month crash course in animation right before starting Uni, and when I met Jim and Blinky I talked trash about how we could do these huge animated videos, even though I had never actually done anything… So we started Iwinyo, and I was thoroughly humbled. I guess it came out OK, though. It was a learning experience. JIM: If there ever was a time that we had internal fights, it was during the Iwinyo phase. I think weâ€™re over that now. Rendering? That depends on what programs/methods youâ€™re usingâ€¦ As the 2D guy, I lack the patience that the 3D guys develop whilst waiting for the goodies to iva[ripen]. I taught animation and cartooning a bit and I work as a freelance animator to pay them bills, and so Iâ€™m all up on Kenyan animation, where it could go, what stories we could tell… but thatâ€™s a long story. JIM: Photography and video are somewhat more immediate, which makes me look hard-working. Itâ€™s just that projects get finished real quick. What kind of software do you use to create the animation? and is uploading videos onto YouTube (from Kenya) as torturous task as I experienced or do you have a secret high speed bunker where we can mooch off of justabandwidth? JIM: Adobe Flash and Adobe AfterEffects. Your YouTube tag is justabandwidth which is very cool. Could one presume that you are total geeks? DAN: Haha! Ms Interviewer, it’s like you know us! 😛 Yes, at least two of us are total geeks (the other one is in denial). DAN: As in, whilst some of us spend all day turning pale indoors with computers and pencils as our only companions, others manage to maintain some kind of engagement with the outside world. Game recognize game, by the way, so should we assume that [Ms. Interviewer] is also the â€œbookish typeâ€? JIM: So all that nonsense about Bill preferring to be at the computer is a lie. Heâ€™s the most outgoing chap. I think itâ€™s strange how itâ€™s never been cool to be a geek (only for a brief moment, when Pharrell and company emerged, then he sold out and became cool)? I mean, everyone else has had their moment in the spotlight; the skaters, the punks, the thugs, the gay boys and girls (heady times, the 80s), the Gothsâ€¦I feel disenfranchised. I am a total geek. I did every geek thing a human being can possibly do; the braces, the spectacles, being bad at sports (except swimming, for some strange reason), being good at computers, going to cinemas to actually watch movies instead of making out at the back, actually using my library card, studying IT in college etc. If there are types of geeks, I guess Iâ€™m the finally-at-ease-with-it kind of geek. I found the use of pictures in the video quite interesting, what is the name of the street at [1:08] of Iwinyo Piny? (I have taken pics of that street but canâ€™t remember the name for the life of me??! What of the one at [1:33] placemark? JIM: That would be Kenyatta Avenue â€“ one of the cuter streets in town. 1:33 is the street that connects City Market to Koinange Street, I have no idea what itâ€™s called; but itâ€™s very textured. Have you guys ever been jacked? There is a depiction in your video, of a guy being mugged and his shoes being taken. Was this a form of commentary on the crime problem in Nairobi? DAN: Not recently. 🙂 As a young person living in Nai, I think you just have to get jacked at some point. We added that bit in the video just for laughs (the video has had a lot of very cool interpretations by people and I’m always scared of telling people what we were thinking as we made it coz it’s so underwhelming… When we’re coming up with images most of the time it’s just like, hey, this would look cool! And then sometimes it comes with its own deeper meaning…)! JIM: Incidentally, I lost my phone on Friday, and two weeks before I lost my ID and electorâ€™s card. And I also lost my wallet the other day (in a bank!) â€“ Iâ€™ve been on a roll. The bank called me the other day to say theyâ€™d found my stuff lying around in the banking hall. Thankfully, all those incidents werenâ€™t the mugging kind; they were the pickpocket kind (sigh) â€“ which is slightly more embarrassing because it makes people think you have no sense of self-awareness whatsoever. In 2004, it was more of a problem than it is now, which is not to say that it doesnâ€™t happen anymore. People actually wear gold chains and earrings and watches on the street these days, because cases of mugging have decreased. Pickpockets still rule, damn them all to Eternal Hell. As for making commentary, I remember Daniel just thought itâ€™d be funny. Does that count? BLINKY: I used to live in Eastleigh, It was hard to keep your new shoes, coz at one point, I was sneaker jacked, and it wasnâ€™t funny. I found out about your band through the blog Sukuma Kenya. What are your thoughts on blogging? How do you feel about your own blogs so far? DAN: I had never heard of that blog before today, but I looked and I thought it was kind of surprising to see Iwinyo right in the middle of a lot of politics! Haha! I think the Net in general has really helped get the word out, Facebook and YouTube and such. Blogging has really helped add a more personal vibe to everything (especially the band blog, I think the other blogs are more like manifestos of some sort but the band’s blog is just goofing around…). I think it really helps to have an online presence as it allows you to present your stuff the way you would want it done, not in a control freak kind of way, just in the sense that, for example, I doubt that we could find a media house that would indulge our fake bio. JIM: Except for the very cool people at Kwani Trust who just slapped it onto their site as is. Sukuma Kenya? Thatâ€™s so cool. I didnâ€™t even know that exists. Say hi to them. Blogging feels a bit self-indulgent sometimes â€“ I use my blog to provide alternative material about the process of making pictures, and the mental stuff that happens before and after. Sometimes people ask me tough questions, and I ask everyone what they think â€“ then I plagiarize the answers I receive and generally look smarter. We used to run an underground arts-and-culture type web magazine thing a few years ago, it was called LabelRevolution, and the thing we enjoyed the most was the community feel of the site. So we try to be very inclusive about everything weâ€™re doing, because thatâ€™s how we make our music. The only reason weâ€™ve come this far (admittedly, not THAT far butâ€¦) is because we make people feel like this is something anyone could do. Whether thatâ€™s true is another matter entirely. BLINKY: I blog sparingly of late because I tend to expose myself a lot in my writing, Iâ€™m trying to find a method of detaching myself when I do. I donâ€™t want to have the whole world know about me. I would like to thank JAB for sending me the images from their initial storyboard, as it gives us a glimpse into their lovely animation work. 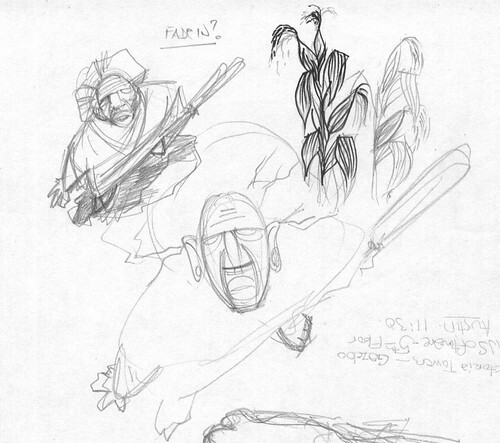 The image on the left is one that shows the progression of sketching the old man’s hair. Keep an eye on the Just-A-Band Blog, Kenyanimation Blog, and Jim’s blog for more updates. Jim will post another AfriGadget soon. (I wont reveal what it is, but it will definitely be ingenious). Thanks guys! I was listless, down out depressed, with chicken, egg and crossing of roads questions weighing on my mind; when my fingers as if they had a series of self-cordinating nanobots, tipitty tapped their way onto a blog called Sukuma Kenya. There, I found a pebble shaped like a play button on a retro CD player encased in a rectangle of sorts with a cryptic ‘You Tube’ logo on the bottom right. I touched the pebble. Holyhaberdashery! I touched it! My fellow Africans, that is how i came to make an interweb acquaintance with Just-A-Band. JAB is defining Kenyan animation and Kenyan techno music with aplomb, piercing wit and style…what follows is the result of smoke signals encoded with morse code and for some strange reason, un-encrypted. Enjoy it, or the chicken gets it. Wait, the egg gets it! oh what the hell…something will get it. Just A Band is composed of? BLINKY: Jim, Dan and Blinky. JIM: Thereâ€™s also our various alter egos â€“ so thatâ€™s 2,303 of us in total. Is the blog Kenya Animation also part of Just-a-Band? DAN: Kenyanimation isnâ€™t actually a Just A Band project, but I work as an animator, and I put up my JAB animation projects there. That blog was set up to bring together animators and animation fans who are from/work in Kenya, just to show people that there actually is such a thing as Kenyan animation, and hopefully be a launching point for bigger local projects, which havenâ€™t had a chance so far coz people donâ€™t really know that a scene exists! The other guys on the list (filterene, Bint Ali, Achoko, Majiqmud) are my collaborators on that project. You band bio is so creative. It reads like a great fantasy graphic novel; have you guys thought of making one? When can we get our hands on it? In the CD liner notes – any fun stuff to look for? BLINKY: Hmmâ€¦it just may happen, really havenâ€™t thought about it. The bio was kinda influenced by (at least I thought) by a George Clinton album cover, it had a really long narrative detailing the bands overindulgence on drugs and stuff till it sounded surreal. We get to introduce the gang that contributed to the albumâ€™s final sound in the Scratch To Reveal CD liner notes, very fresh cats if you ask me. JIM: Now that you mention it, the fantasy graphic novel does sound cool. I think of our bio as a parallel story thatâ€™ll run alongside the much more drab reality â€“ we plan to update it each time we do something new. The liner notes on Scratch To Reveal are slightly nonstandard. The cool thing about being unsigned is that there are no marketing-types breathing over your shoulder, urging you to standardize your output. It was actually Danâ€™s idea to do the liner notes in a different way â€“ Iâ€™m ashamed to say I was one of the people who asked, â€œDo WHAT?â€, but once we tried it out, it actually felt much more relaxed and true to the way the music was made. I saw that Daft Punk made a movie! Electroma! (Two if you count the one that went with Discovery â€“ Interstella 5555) and I can sooooo see Just A Band doing some Psychedelic 88-minute Experience (at some point). But first things first, we have an album to push (I think one of the reasons we get so psyched up for JAB stuff is coz it could go so many ways, it’s always exciting to sit and plan out projects…)! The album cover for your CD has an arresting image…is there a story behind it? Did the idea pop into your mind or was it an organic, incremental idea that morphed from something? What is your creative process? JIM: This is definitely a morph â€“ the original blurry concept was to have angry, cathartic energy of some kind on the cover; and cables. Cables are always cool. The images I have in my head always morph into something else by the time theyâ€™re finished. The final image ended up being something rather calm and contained â€“ whilst retaining that arresting vibe youâ€™ve mentioned. Of course, Lenny (the model) helped a lot â€“ I chose him because heâ€™s like visual play-dough and he likes to know what weâ€™re aiming for visually. I explained the general idea to him â€“ and played loud drum and bass and clashy electro during the shoot. My creative process; I typically see the visual in my head â€“ slightly foggy around the edges, but there nonetheless. Then I work to transform that foggy visual into something real. It feels like Iâ€™m cheating, sometimes, because all Iâ€™m doing is translating the sketch thatâ€™s already in my head. In the process of doing that translation, many things change (somewhat like a multi-branched sequence of little decisions on execution) and the final results usually surprise me just as much as anyone else. I have only listened to one song from your newest album, is the music on Scratch To Reveal kind of in the vein of Iwinyo Piny or are there more varied sounds? BLINKY: Iâ€™d describe the album as adventurous. We all bring different influences to the Just A Band table plus an unwillingness to stay within proscribed boundaries, Iâ€™m influenced by acoustic guitar stuff, funk, jazz, hip-hop and dance stuff, everyone elseâ€™s influences are evident all through the album. DAN: The first single, Fly, is up on YouTube and is pretty different, a bit more aggressive and obviously scifi as opposed to Iwinyoâ€™s flirtation with spacey sounds. JIM: Somewhere towards the middle, the album reveals a softer core; comes back to earth, if you will. Some people have found this surprising because the overall look of the album says â€“ electronic â€“ so having pianos and strings in the middle could be a bit bewildering for some. I see Daft Punk is an influence on your music; what are your thoughts on the Gorillaz? Would you work with Damon Albarn if he asked? What other types of music/musicians do you gravitate towards? Graphically speaking… which animators do you like? Cartoons? Which ones?? BLINKY: I know for a fact that [Albarn] did some stuff with Fela Kutiâ€™s band mates on a trip to Nigeria, so we wouldnâ€™t be the first African peeps heâ€™s working with, but Iâ€™d be absolutely down for it! Iâ€™m currently jazzed by Citizen Cope, Raphael Saadiq, Lupe Fiasco, John Mayer, Jamiroquai, St. Germaine, Van Hunt, Foreign Exchange, Bob Sinclair and Asa. Iâ€™m abit out of my waters with the animation vibes, though I like Aaron McGruder of The Boondocks fame. DAN: DEFINITELY we’d collabo with Albarn (right after we regain consciousness)… Every project he does is SO DIFFERENT, from the Mali Music albums to Blur to Gorillaz…very much the kind of thing that we hope to do, as well. JIM: Are we? I just think that George Clinton guy had cool outfits. So, maybe visually. BLINKY: George Clinton is cool! Graphically, I’m very much into manga and anime, in terms of the stories, culture, even the shortcuts they take to meet their crazy deadlines! A random list of favourites: Samurai Champloo, Mind Game, Triplets of Belleville, Studio Ghibli films, Satoshi Konâ€™s work, Genndy Tartakovsky, Jamie Hewlettâ€™s Gorillaz work is really well designed and moves so fluidly, The Boondocks. Ralph Bakshiâ€™s confrontational movies from the 70s are a huge creative inspiration for what Iâ€™d like to do in animation in future. Thereâ€™s an animation director called Koji Morimoto (he did the Beyond segment in The Animatrix), he makes my eyes water. Also off The Animatrix, the World Record segment was done by another new fave, Takeshi Koike, who is actually a celeb in Japan! How interesting, celebrity animatorsâ€¦ I would like to go study at the feet of Moebius, the French comic book artist. And a lot of movies and books (I may be a bit of a junkie). We also keep an eye on the graphic design and motion graphics scene, and that’s always a visual overload. JIM: Daft Punkâ€™s Discovery was one of those albums that really excited me (and it still does). Frankly, I like the visual detail of the Gorillaz more than their music. In fact, I really donâ€™t think I like their music. But I like the way they work so hard on the supplementary material that helps you form an opinion about a band, the back story, the promos. I like people like Madonna and BjÃ¶rk for putting in extra effort and really being in control of their image and sound, and giving people some fantasy to believe in â€“ however slightly. When I was a kid, I loved the musicians who went beyond the music and created lush record covers, and placed their music in some kind of fantasy literary context. Or even the people who explored themes other than the usual â€œlove, girls and sexâ€. I love the way the disco dudes touched the sky and went beyond to other planets. Why confine yourself to dull old Mother Earth? I think Europeans are better at it than the Americans (with the exception of people like Madonna, as mentioned above). Americans are very literal about their music â€“ Band X fits into this genre and you shouldnâ€™t ask where theyâ€™re from or why theyâ€™re doing this. Europeans are very cool about alter egos and costumes and silly things like that. From your Kenyanimation blog, it appears you are working on another project – Two Countries; will it be a CD & animation type thing? When can we expect to hear of a premiere? DAN: So, when we started off with Kenyanimation (which is not a Just A Band project, actually) we wanted to actually make something under this new group. The idea for this short animated movie was lying around in someone’s sketchbook, so we decided to make that. It’s kind of like a Gado cartoon come to life, political commentary vibes, but with a bit of Tom and Jerry thrown in, and (hopefully) a Just A Band score (as in, a proper “classical” score, which would be a new thing for the band). The project has stalled for a bit as people get more involved with their various hustles, but weâ€™ll get it back on track soon, and as itâ€™s just a short, it could be done by yearâ€™s end. As for how weâ€™ll put it out, Iâ€™m not sure yet but maybe weâ€™ll try some festival screenings and so forth. Do you perform live shows? If so, where can we catch you guys? BLINKY: Coming soon to an area near you. DAN: We’re actually working on the live shows now, figuring out venues and instrumentalists, and all the cool fun stuff like projections, or not. We will be unveiling the whole shebang in August. Details will be on the site/YouTube/Facebook. JIM: Weâ€™re working on making it something interesting â€“ because I am skeptical that Kenyans would be OK with sitting around for several hours watching a bunch of geeks fiddling with guitars. So pom-pomâ€™s, dancing, makeup, lights, psychedelic footage and action â€“ on a shoestring budget, as always. Ngoma Process – A Bruce Odhiambo Project. This is a CD that would fit neatly into the category ‘ World Music’, though i would call it something like Kenyan Ngoma. There is Kapuka, Genge, Bongo, time for the genre Kenya ngoma? The CD has the types of songs that have a cultural thumbprint; it is immediately identifiable to Kenyans. You know that deep down familiarity that makes you feel intouch with your homeland. Rythms that sing to a certain part of your being, where you feel ‘aah this is home’. Now add some sharp production work, really good musicianship and voila! or… haiya! you have a good CD that you can play at a party for your pals, kenyan and non-kenyan alike. What i am trying to say is that for Non Kenyans, this is a really good CD that gives you sense of the rythms kenyans like. It has Taarab, folk – maasai/kalenjin, Luo, and Benga influences. Fun song, especially if you are familiar with Eastleigh, an estate in Nairobi: â? ?Mogadishu Ndogoâ?[small mogadishu], â? ?Estate moja kali kama nagasaki Ratha! Ratha! Si waria naambia nyinyi hakuna brefte brefte 100%” (pronounce pehRRrr-sent), about the things you can buy (including weapons). KJ of Redykyulas channels one of the characters from their sketch shows -Waria. VERDICT: Buy this CD, throw a party with good wine (did you know that there is Tanzanian wine? ) Relax and dance whenever it strikes you to. The world is in much too much turmoil , chill with this. You can listen to more songs on the jcleff jukebox, and buy a copy on Jcleff.com once its fully set up, or use their contact page. It would be really good if it could be available on Calabash music – they have the music e-commerce thing down pat, plus it would have a more global stage, maybe later. The official launch of the CD will be in Nairobi, tentatively set for early December per Bruce, so the CD will be available there. *welcome songs are just that – to welcome someone, often sung at get-togethers or even at meetings to welcome dignitaries and such…a short example is the song done by the women in this documentary on Wangari Maathai.